When you are going to step on your foot to the music world, different guitar terms and infographics will come on your eyes to meet. There are many unfamiliar terms out of your knowledge to learn. Just knowing the chords won’t help you become successful. For being professional, gathering each term with descriptive knowledge is vital. For an instance, you can seek bits of help from any professional guitar instructor as well. To minimize your worries, I am here with this article to let you know about the accessories and terms of this musical instrument. Get started your youthful musical journey with it. Let’s initiate further discussion without any more delay. Before you learn playing guitar, necessity is to determine the guitar parts firstly. The following list is the parts of the guitar to know about. To play each note with fingers, this is the area adjacent to the neck side of the guitar. Guitarists find the right notes and use their fingers to play music with the fretboard. Strings are a bunch of wires made of nylon or metal. By making vibration, it creates sound eventually. Numbering the strings is must to have in your knowledge as a beginner. Amidst of 6 strings the first one you will find as the thinnest. Ultimately the sixth string is the thickest one to position the finger. This is named as E. That’s how it comes respectively with A, D, G, B, E, at their position. Tuning pegs are there to reduce or enhance the extra pressure of the strings for convenient use. This is going to bring changes in the pitch as well. Fretbar is located on the fretboard that allows the guitarists to play notes. Usually, they are made of metals or stripes. The ultimate space you find between the fret bar is called fret. Usually, this functional equipment is found on electric guitars mostly. The electromagnetic strips generally produce a magnetic field on the body of the guitar. That affects the tuning of the instrument. The long wooden part of the guitar attached with the headstock, truss rod, fretboard, and tuners along with other necessary equipment to the body is ultimately called the neck. The quality of the neck of the guitar affects the instrument tuning. Furthermore, it efficiently resonates the sound capacity as well. This part of the guitar is linked with the neck. The tuner pegs are also available there. This is the key part of any guitar indeed. The area where you can eventually get the pickups, bridge, bridge pin, saddle or dials etc. This part is mostly found in Acoustic guitar. Generally, the pins fiercely hold the pins on the bridge part. This area covers the body to hold the strings. Basically, this is the most essential part that contributes to bringing solidity to the tone. Eventually, it leaves an effective resonance to the tune indeed. This is the switch that goes for pick up activation. On the very front side of your guitar, you will get a liver and that is a toggle switch. The tuner is such kind of apparatus that efficiently determines the pitches lower, higher or middle rhythm to open the strings. Eventually, the frequency of the guitar mostly depends on it. Capo is a functional clamp linked to the neck part of the guitar. It helps in lowering the action when needed actually. In a guitar, you will get triangular shape equipment and that is called a pick. If you want to pluck the guitar strings any time, you can easily do so with this tool. A guitar strap protects your instrument from untoward accidents. Also, it reduces extra pressures on your arms while holding the guitar. Usually, they are made of cloth or leather. This is a part of the guitar that is a removable element of this instrument. This device of the guitar is actually used for the necessary replacement of strings. With the tuning pegs, it is effectively attached to reduce the tension. This is a fair way of playing guitar by running the fingers on the required notes. Through this ability, a guitar maintains the tuning. Power chords are a part of electric guitar mostly that displays the roots, 5th and octaves. Choosing an acoustic guitar is not that easy process to go with. It makes you feel confused more when you are a beginner in this field. Prioritize buying such a guitar that exactly suits your budget, skill and playing styles. Let’s have further details about that. 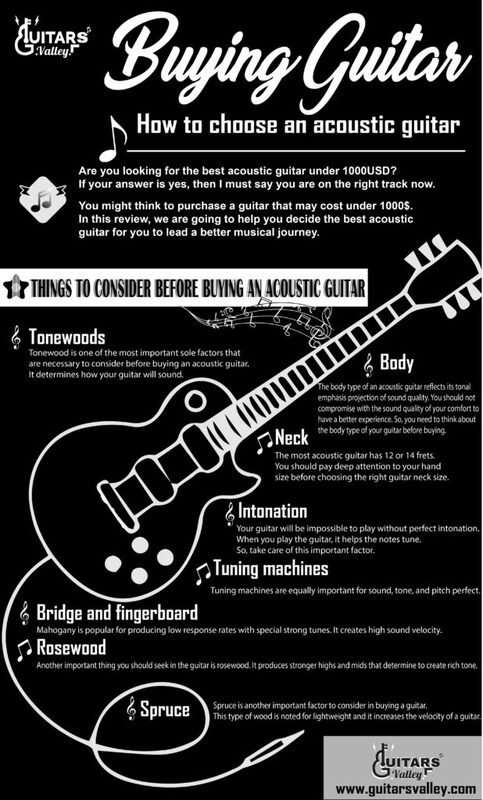 There are so many types of acoustic guitars based on different categories. Of course, you have a particular sensation of a specific one. Read the following category of acoustic guitar to pick out the right one for you. This one goes with the classic genre. It covers a large body along with a spacious sound hole in it. To play folk, rock or different kinds of pop music, traditional acoustic guitars should be your absolute choice. It covers with a set of panels and buttons. It enables the guitarist to plug the instrument without any amp assistance. This is so versatile to use with melodious acoustic tuning. If you have a passion for playing world music or jazz, then this one is absolutely a perfect choice for you. This hybrid musical instrument can widely be used by an amp. Tonewood is one of the most important facts to consider as it permits to produce high-grade clear and brighter sound capacity. Deep melodious tuning along with better crafting dictates great tonewood. Maple wood is likely to produce clear sound. It resonates well as well as used in the neck. Another type of wood is mahogany mostly used in the decent level of guitars. Eventually, it helps in producing good sound with the strong, supportive and malleable wood surface. Best acoustic guitars have decent tonal quality. Look for good bass in the sound level that produces clear and brighter tuning as well. Make sure you determine your playing style and choose your preference in accordance with that genre. What size and thickness of the neck you should choose completely depends on the ultimate body of the guitar. Generally, acoustic guitars have 12-14 fret necks to the body area. Determine for having small diameter based neck to have comfort in playing. You can call it a soundboard also. An interior bracing widely supports it. The space between the upper and lower bout is precisely referred. How will be the sound and playability mostly depends on the shape of the body of the acoustic guitar? 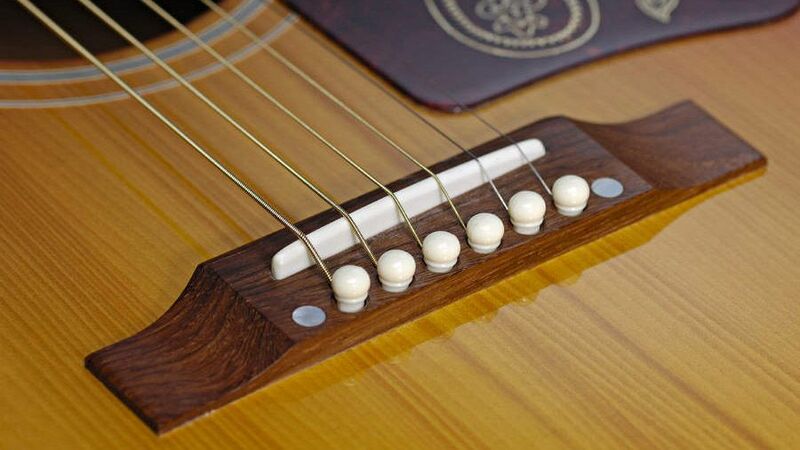 Moreover, the bridge of the guitar ultimately brings the string transmission in the sound. Budget is another noticeable factor to keep consideration. There is so many acoustic guitars’ category with different budget level. Choose one that goes with your money limit as to intermediate or beginner level instrument. Another considerable fact before buying an acoustic guitar is the intonation. It has certain effects on tuning and creating overtone. Keep analyzing the guitar infographics for creating a successful journey in your musical career. Some steps must be followed at the very beginner to get hands on it efficiently. Here they are. 1.First of all, you need to find a suitable guitar to play music with variable intonation. At this phase, you can seek help from any professional. 2. Find out your comfortable position. For an example, if you feel as easy as a leftie, you should buy that typed guitar. 3. Pick up the basic knowledge and get to know all about that. 4. Try to improve the tunings which are considered one of the most important facts for practicing. 5. Posture is another important fact along with knowing guitar analytics. Nevertheless, you must know the suitable posture that affects playing musical instruments most. 7. Patiently learn the skill of playing chords and scales. Give them try again and again. Certainly it becomes easier to play guitar songs when you know the ins and outs of guitar infographics. Abovementioned terms are very crucial as a beginner to learn about. For that reason, I have a suggestion for you. Keep hanging the full list in your living room before your eyes. Sooner you will get habituated at reading and memorizing them effectively. 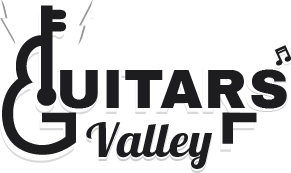 Hopefully, this article is a salient resource to enrich your guitar knowledge. It’s really enjoyable to have some sweet and melodious music in life.